Riding, reworking and interpreting classic works of western literature is the default setting for a lot of UK male-led dance companies of late; Lost Dog’s Paradise Lost/Juliet & Romeo, Mark Bruce Company’s The Odyssey and Dracula, Avant Garde Dance’s Fagin’s Twist, James Wilton Dance’s Leviathan and James Cousins Company’s Rosalind are just some of the examples. Often framed as an opportunity to attract new or theatre audiences to dance, it could be seen as a smart marketing device or a poverty of original ideas. Macbeth has a particularly strong hold on current choreographic minds with Company Chordelia’s Lady Macbeth Unsex Me Here, Mark Bruce Company’s Macbeth and now K.R.U.M.P Macbeth by Theo ‘Godson’ Oloyade all undertaking the Shakespearean Scottish play in the last 12 months. At 55 minutes long with a cast of four (Amanda Pekfou, Jordan Franklin, Dean Stewart and Vincent Maduabueke) this is Oloyade’s first full-length theatrical work after spending a number of years performing with Boy Blue Entertainment, making shorter works at Breakin’ Convention as well as being an excellent exponent and teacher of krump. Whereas others may ply their trade at Resolution, building up experience in other platforms, or refining the work back in the studio Oloyade has chosen to premiere K.R.U.M.P Macbeth at Laban after an earlier showing of a few sections at Redbridge Drama Centre in May. Macbeth is a text full of hooks and angles of approach: power, murder, psychological warfare and familial tyranny. Mix this with the depth of emotion, delicate and explosive qualities and body shuddering invigoration that krump has in the cypher or battle and K.R.U.M.P Macbeth has a suite of possibilities; unfortunately it fails at nearly everything it attempts. With no director, dramaturg or outside eye present according to the programme notes, Oloyade as choreographer is left holding responsibility for the blocking, movement and stagecraft, but his theatrical inexperience is brutally exposed with a raft of saggy scenes, continual slow movement of limbs that do not result in tension or emotional engagement, a number of moments inexplicably playing upstage left, and a stick-stabbing shadow death scene that would fit better in a 1970s schlocky horror film. The staccato nature of K.R.U.M.P Macbeth feels like a diluted version of a York Notes guide to a Chinese whisper broadcast of the original Shakespearian play. It is unrecognisable as Macbeth and Oloyade offers no alternative artistic interpretation, little depth of research/inquiry and no emotional narrative to help us feel anything towards any character. Choreographically Oloyade has constricted the form and at the same time constricted the work; it is full of unnecessary blockages with the dancers waiting for the obvious musical changes from Michael ‘Mikey J’ Asante’s dominant soundtrack stretching out the movement without developing the narrative, and attempts at synchronised krump are inadequate with the stomps out at least 50% of the time. There is an uneven quality in their jabs, isolation/physical punctuation and our eyes are consistently drawn to those dancers who are unable to keep time. Mixing and/or blending krump with contemporary knee slides and fake rifle holding neither satisfies the krump purist nor brings a new choreographic vocabulary to those unfamiliar with the form; we’re left with a sticky choreographic mess that is only exacerbated when in the final scene ‘KRUMP’ is blurted out over the soundtrack offering all the subtlety of a hip hop anvil. Can you imagine a Scottish Dance Theatre soundtrack blaring ‘CONTEMPORARY DANCE’ in a climactic scene or Ballet Cymru using a ‘BALLET’ audio sting in the final moments? When the stage is bathed in red the Goddess of Blunt Instruments is making it obvious: we know what is going on. 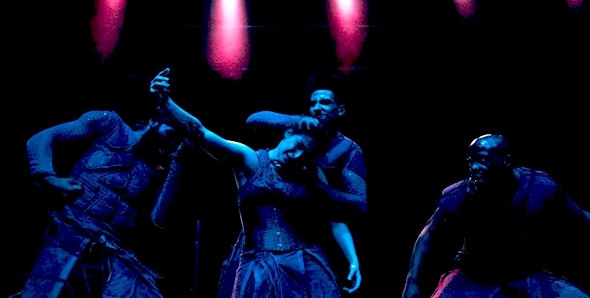 Within the company there are dancers with individual talent and virtuosity; Maduabueke offers charged flickers of intensity whilst Stewart delivers some moments of choreographic power and complexity, but there is so little glue, context or relationship forged between them that it erases any of the possibilities. When Oloyade presented his eight-minute work Hell’s Gate 7 at Breakin’ Convention last year there were interesting relational dynamics, power and theatrical possibilities demonstrating that he has choreographic talent, but the leap from an eight to a 55-minute work is too big. The stagecraft, direction and dramaturgy need consideration and attention if he wants to make a full-length theatrical work. Within the individual scenes of K.R.U.M.P Macbeth there are interesting shorter sections that either could be harvested and sit alone in their own right as smaller pieces or re-worked and expanded.